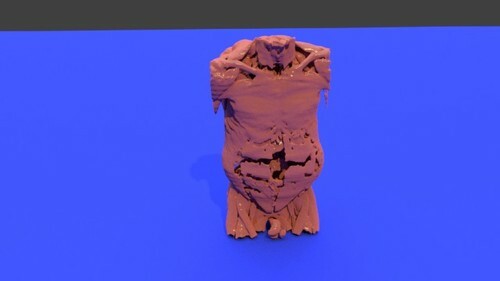 Muscles of the whole body, including chest, abdomen and pelvis. 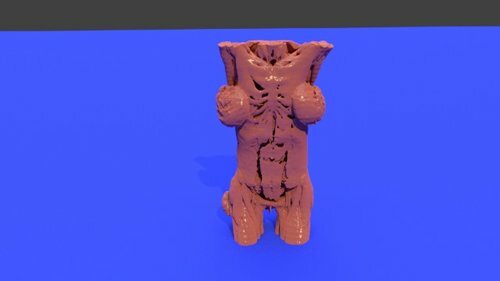 This whole body 3D printable STL file includes the chest, abdomen and pelvis. 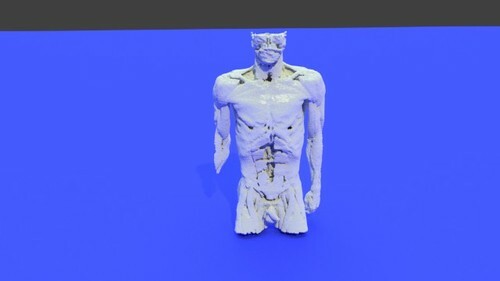 It was converted from an NRRD file to an STL file using democratiz3D, embodi3D's file conversion service. The chest wall (thoracic cage) is composed by twelve pairs of ribs laterally and the sternum anteriorly. The ribs are attached to the dorsal vertebrae (thoracic spine) posteriorly and along their costal cartilage to the sternum. The thoracic cage main function is to protect the vital chest organs such as the heart and lungs. The cervical spine is the upper most spines forming the spinal column, extending from the skull base to the level of the thoracic vertebra (the spines with attached ribs). The cervical spines are usually seven and the main function is to support the skull and to protect the spinal cord. The dorsal (thoracic) spine forms the middle portion of the vertebral column extending below the seventh cervical vertebra to above the first lumbar vertebra. The dorsal spine is formed by twelve vertebral bodies. 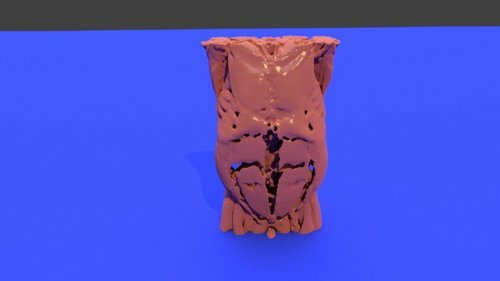 The vertebrae forming the dorsal spine are unique in shape as they are the only vertebral bodies articulating with ribs. The lumbar spine represents the mid-lower segment of the vertebral column and is composed of five adjacent vertebrae. They are convex anteriorly to form a lumbar lordosis. The lumbar spine facet joints allows limited movements and rotation. The bony pelvis is formed by 4 bones; a pair of hip bones, the sacrum and the coccyx. The bony pelvis supports the pelvic viscera and works to transmit force from the axial skeleton to the lower limbs. The two hip bones are related anteriorly by the symphysis pubis and posteriorly to the sacroiliac joints bilaterally. The chest wall (thoracic cage) is composed by twelve pairs of ribs laterally and the sternum anteriorly. The ribs are attached to the dorsal vertebrae (thoracic spine) posteriorly and along their costal cartilage to the sternum. The thoracic cage main function is to protect the vital chest organs such as the heart and lungs. The cervical spine is the upper most spines forming the spinal column, extending from the skull base to the level of the thoracic vertebra (the spines with attached ribs). The cervical spines are usually seven and the main function is to support the skull and to protect the spinal cord. The dorsal (thoracic) spine forms the middle portion of the vertebral column extending below the seventh cervical vertebra to above the first lumbar vertebra. The dorsal spine is formed by twelve vertebral bodies. 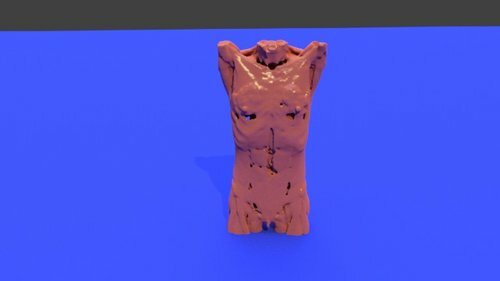 The vertebrae forming the dorsal spine are unique in shape as they are the only vertebral bodies articulating with ribs. The lumbar spine represents the mid-lower segment of the vertebral column and is composed of five adjacent vertebrae. They are convex anteriorly to form a lumbar lordosis. The lumbar spine facet joints allows limited movements and rotation. The bony pelvis is formed by 4 bones; a pair of hip bones, the sacrum and the coccyx. The bony pelvis supports the pelvic viscera and works to transmit force from the axial skeleton to the lower limbs. 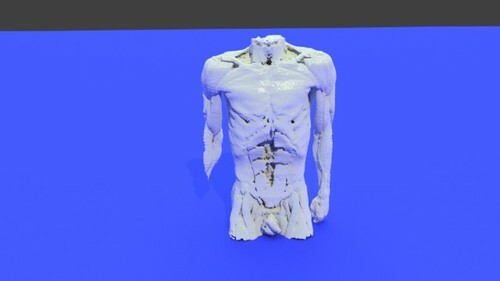 This 3D printable STL file contains a model of the torso, neck, and arms was derived from a real medical CT scan and shows anatomic structures in great detail. 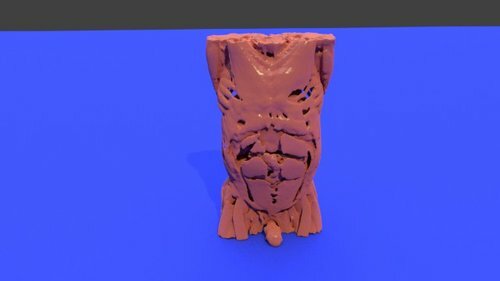 This model was created using the democratiz3D free online 3D model creation service. 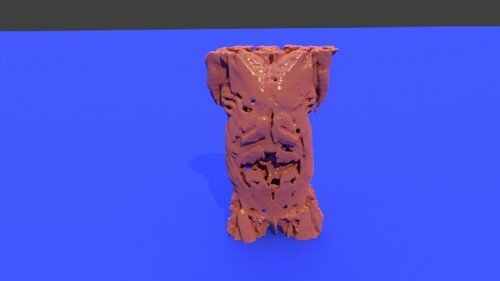 This 3D printable STL file contains a model of the torso and arms was derived from a real medical CT scan in high detail. 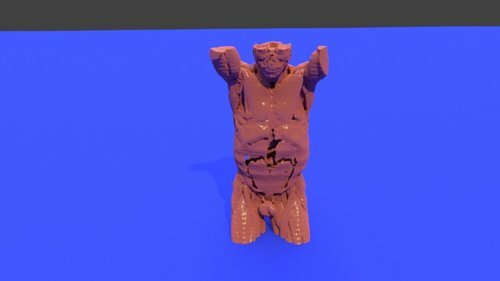 This model was created using the embodi3D free online 3D model creation service.